The Vikings had the NFL’s top defense last year. 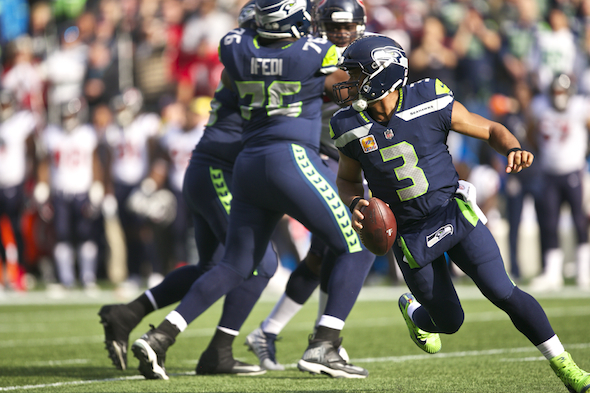 The Seahawks are desperate to establish the run in the dress rehearsal game Friday. On the hot seat: RT Germain Ifedi. Ever since the Seahawks began their rebuild/repair/revival/restoration/reset/renewal/revamp (choose one) in the pursuit of respect, coach Pete Carroll and the members of his church choir have preached the run game as their 2018 holy grail. Brothers, it’s time to deliver. Flashes have been visible in the first two fake games, but nothing was sustained. The NFL tradition is to use the third game as the dress rehearsal, deploying first units for a longer trial. Unfortunately for the Seahawks, the third game is on the road in Minnesota (5 p.m. Friday, Fox) against the defense that in 2017 was No. 1 in the NFL at 276 yards per game (the Seahawks were 11th at 323). On the ground, the Vikings allowed 84 yards a game, second-best (Seahawks were 19th, 114). If it seemed like 84 was about what the Seahawks had on the ground total for the season, you have some idea of the urgency with which the Vikings test is approached. In fact, eagerness bordered on the wacky, if you were listening to offensive coordinator Brian Schottenheimer Wednesday. “We’re looking forward to some of the problems that they present,” he said of the Vikings, sounding a little like President Trump encouraging his attorney, Michael Cohen, to be transparent with prosecutors. But we get the point — in a no-counter, it may useful to have the bejabbers knocked from you in order to establish a baseline of badness. The evening’s pivot point on the topic will be out at right tackle, where presumptive starter Germain Ifedi had a bit of a rough game Saturday in Los Angeles, where the Chargers’ premier pass rusher, Melvin Ingram, mostly had his way. Ifedi’s status as starter has been the shakiest among the five O-linemen, in part because he led the NFL in penalties (20) last season, and also because he gets beat a little too often. Sure enough, Carroll said Monday that George Fant, a coaching-staff favorite, was being moved from backup left tackle to compete with Ifedi for the right tackle spot. Fant, you may recall, is the former basketball player from Western Kentucky whom the Seahawks for three years have wanted to transform into the next great tackle. In 2016, he started 10 games at left tackle by injury default. In 2017, he was booked as a full-season starter, until almost exactly a year ago in a fake game when a teammate rolled up on his right leg and tore its ACL. Only in the last week has Fant been given the full go after surgery. The idea here is to see if Fant, an undrafted free agent, can scare Ifedi, a No. 1 draft pick, straight. “George obviously is feeling better now so, we’re just trying to create competition,” Schottenheimer said. “We think that will bring out the best in everybody. It’s unlikely that Fant, with so little experience on the right side, would supplant Ifedi in the event of another mediocre game. Still, the Seahawks need to know what their options are, should Ifedi, for example, become the first NFL player to foul out with six personals. They also need to know whether the group can discourage a good defense even a little. In the first game against the Colts, the Seahawks had 87 yards rushing on 22 carries, many against reserves from an already poor 2017 defense. Last week, the Seahawks had 60 yards in 16 carries, a paltry total created in part by Schottenheimer’s desire to get in passing-game work. “I probably got away from it a little bit too early,” he said. “I was trying to give a couple of the quarterbacks and some of the other skill guys a look. Early in the game, we were running it really well, we were running hard. (We are) encouraged. There are still some things that we need to look at, our gap schemes, we want to improve that a little bit. The run game took a hit this week when RB J.D. McKissic broke a bone in his foot during practice and will miss four to six weeks. Also out is Rashaad Penny, the No. 1 pick, but his broken finger is a minor inconvenience. Presumably, Chris Carson and C.J. Prosise will get the bulk of the carries, unless Schottenheimer forgets again. That seems less likely because in the truncated calendar of the modern NFL training camp, there just isn’t time to screw around, especially when engaged in a remodel/rebirth/renaissance . . . whatever. And if Ifedi messes up, you might see different player-types by the regular season. This smells like another season of running-game clown shoes and Russell Wilson running for his life. Can’t wait. Brown, Pocic and Fluker will be better than 2017 versions. So will TE blocking. Maybe you’re smelling the forest fires. Pretty shaky is not the way to start the season. Rather than the previous trial by fire methodology, where Cable used formations that assumed correct line play and didn’t compensate enough with tight end help, I’m hoping that Solari will do the right thing and give the help that is needed. “Will Dissly, you Sir are assigned permanent residence on the right side of the line. If we’re doing OK, or if the play breaks down, Russ might occasionally toss you a pass”. Also, hoping that the rest of the line can remain stable throughout and grow together – that could be a possible plus over last season. Time to join the trend in the NFL expand the passing game. Improved line (?) has not improved the offense. The present group of receivers seems underwhelming but hey the first game that counts will or may not provide the magic that seems lacking with the Hawks. NO! If it was time to “join the trend” of the expanded NFL passing game, they wouldn’t have gotten rid of Bevell. They were a front-runner in that trend. You saw the results. Gots to be able to run close to the NFL average with your backs before the passing game works better. Every time I think about the right side of the offensive line, I automatically do the sound Lurch (Ted Cassidy) used to make when he was troubled. I can’t spell it, but it sounds something like this: uuuuuuuuuggggggggh. http://www.barbneal.com/wp-content/uploads/groan.mp3 I shouldn’t have to think about the offensive line (I know, all but maybe 2 NFL teams are having OL troubles), but that’s been the story for YEARS now. And if George Fant is asked to be the “answer,” that’s not fair to him or to us. uuuuuuuuuggggggggh. Lurch? Good pull. One of my favorite non-speaking TV characters. I used to make that sound whenever Benoit Benjamin took the floor for the Sonics. Love the Lurch reference! But I’m still with Coach Gomez (all positive all the time) and remain mostly optimistic that the re-whatever has put in place some really promising players who will only get better. I’m not sure what’s more discouraging. That Ifedi is still the presumed starter, or that a basketball player is once again the savior we’re all hoping for. Some serious drafting blunder debt coming due. Ifedi and McDowell, back to back at the top. Speaking of the holy grail, the Seahawks cannot withstand another year of Wilson trying to “run away, run away” as their best offensive weapon. At some point, Wilson will pay the physical price, which is too disturbing to contemplate. Carroll hears you. It’s part of why Bevell and Cable were fired and a durable RB was taken with the first pick. “I probably got away from it (the run game) a little bit too early.” No. No, no, no, no, no. This is terrifying. I never, ever want to hear that phrase uttered in relation to Seattle footballing again. I realize it was a fake game, but in Schotty we have yet another ex-QB calling the plays. I also realize Schotty has had great running games in the past, but he has also had scrap pile QBs, forcing him to stick to the run. I hope the temptation of having a Super Bowl caliber QB doesn’t give him doe-eyed brain fog. The past three years, Pete has been preaching to “get back” to the run game. I do NOT want to hear anything about getting away from the run game too early once the real games start. If Pete wants to run, then by god he had better make damn sure HIS offensive coordinator is on the same page. This whiz-bang fancy-schmancy whirlygig flinging it all over the field crap has to stop. Its why they got rid of Bevell (three years too late). Saw that. 2017 was worse than I realized. That’s why the game Friday looms larger than most fake games. Schottenheimer is experimenting with players new to him, and some are new to the Seahawks. Don’t read too much into any remarks during camp. I expect a slow start to the season. Shakedown cruise. I’m still optimistic about the team this year, I think they are way better than critics are giving them credit for. That being said, I had one position of concern at the start of training camp, DE, but now at the end of training camp I’m just as concerned about the RT and FB positions as I am about DE. Green has been good and Jefferson serviceable at DE which may save us there. Madden is the default FB by virtue of injuries resulting in releases at the FB position, a position that was very important to the Hawks during their top 5 running game years. Perhaps the most disturbing is the RT, Ifredi despite praise from Brown and the changing of the OL coach seems maybe even worse than last year, a real feat. Jones looked to be taking his job but then went down with an injury that should stunt his growth and miss regular season games. Even Battle looked better in the preseason than Ifredi but then he also had a injury that would include missing important training camp snaps. Beavers is currently the only person at RT that has looked worse than Ifredi. I think Fant can beat Ifredi for a job but it is a question of when, 3 games, 6 games, 10 games? That timeline doesn’t really help unless Fant turns out to be better than Jones who will be back in the fold by then. Ya, I never heard a timeline after the surgery which is not a good sign. Maybe we will get lucky and Fluker can run block 2 people on the right side, a true “hold my beer Ifredi, I got this,” moment. If not we may see a lot of left and inside runs but nothing to the right for most of the games which has got to hurt the running game chances.